Prepare for your Ultrasound Exam with the Midwife Sonography ExamSim by ACNM and Pegasus Lectures, Inc.! The ExamSim provides simulation of the ARDMS Midwife Sonography examination with interactive test-taking, three timed full length exams, a patented algorithm to help the user determine their level of preparedness to sit for the exam, and more! By using this invaluable ExamSim tool to prepare for your Midwife Sonography Exam, you will have studied the key concepts, focused on your areas of weakness, and used your valuable study time efficiently and effectively. After the eligibility requirements have been met and your application has been approved, you can take the computer-based examination. The Midwife Sonography examination is only offered during select periods of the year. See schedule below. Updated eligibility requirements were developed that accurately reflect midwifery scope of practice which should enable more midwives to become eligible to take the exam. With more midwives taking the exam, we're confident the exam process will meet national certification standards for the midwifery community. ACNM members can review the updated eligibility requirements, certification process, testing locations, and sign up for exam reminders at www.ARDMS.org/MW. Visit www.midwife.org/midwife-sonography-certification for information and resources ACNM has available to help you prepare for the examination, including updates about workshops, exam simulations and other materials. Sign-up for the ultrasound Pegasus education programs at www.pegasuslectures.com. ACNM's ultrasound education partner has an online exam simulation program, a comprehensive, modular eCourse to teach ultrasound principles, and it offers hands-on training. examination(s) they wish to perform." Neonatal Nursing (AWHONN). ACNM is working with AIUM to develop joint guidelines. 91% of respondents agreed that there is a need for the development of a credential/certificate examination in women's health ultrasound. 95% of those in favor of a credential/certificate believe that improved patient care would be the biggest benefit to the midwife community. 83% of respondents said they would be interested in obtaining a credential/certificate examination in women's health ultrasound. Of these, only 9% felt that their current level of knowledge would be sufficient to take a credentialing/certification examination in ultrasound. and Diana Dowdy CNM, RDMS. objectives for didactic and clinical courses were developed and disseminated. developed to offer midwives on-line didactic education and test review courses. Physics and instrumentation relevant to type of exam to be performed (e.g., physics of ultrasound, proper use of machine and transducer selection, ALARA principle). Required elements and components as described by AIUM for a specific exam to be performed (e.g., imaging parameters for each trimester). Required anatomic landmarks defined by AIUM pertinent to type of exam to be performed (e.g., landmarks for biometry). Indications for exam (e.g., indications for POC versus the Standard Examination). Clinical implications of normal and abnormal findings (e.g., documentation, communication, consultation). Ultrasound safety (e.g., output, frequency, length of exams). Components of a complete ultrasound report (e.g., orientation of image, documentation). Client education (e.g., explanation of procedure, communication of results). Additional didactic content can be specific to type of sonograms to be performed (e.g., first-trimester dating vs. cervical length). this rubric is available on ACNM Store. Required elements and components as described by AWHONN, ACOG or AIUM for the type of exam to be performed. The required anatomic landmarks as described by ACOG or AIUM pertinent to the type of exam to be performed. Indications for type(s) of exam(s) being performed. Components of a complete ultrasound report. Patient education.8. Process of informed consent regarding the scope and limitations of the various ultrasounds performed. Process of informed consent regarding the scope and limitations of the various ultrasounds performed. in Obstetrics and Gynecology. A practitioners Guide. 4th ed. 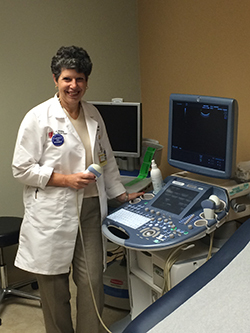 Ultrasound into your practice: Why and How to Prepare [Video]. Menihan, C. & Kopel, E. (2014). Midwives. Sonocations: New Paltz, NY. the Practice of Midwifery, retrieved from http://www.midwife.org/ACNM/files/ACNMLibraryData/UPLOADFILENAME/000000000051/Standards_for_Practice_of_Midwifery_Sept_2011.pdf. in pregnancy. Practice Bulletin 101, retrieved from http://www.acog.org/~/media/Practice%20Bulletins/Committee%20on%20Practice%20Bulletins%20--%20Obstetrics/pb101.pdf?dmc=1&ts=20140828T1112546585. Lathrop, A., & Blackburn, M.
of Obstetric, Gynecologic, & Neonatal Nursing, 40(5), 654-661. J., Young‐Lin, N., Bearman, S., Dau, K., & Vargas, J. (2015). of Midwifery & Women's Health, 60(6), 727-734. Obstetrical Ultrasound in the Third Trimester(Clinical Bulletin No.